An important contribution to the record of a fascinating era in New Zealand's international relations. 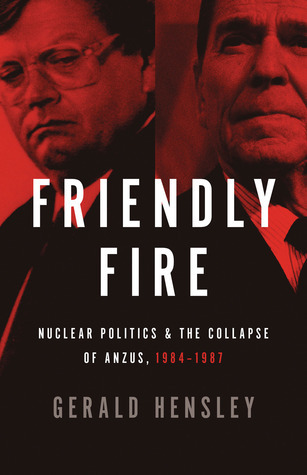 Hensley gives a diplomatic insider's view of the crisis over nuclear ship visits that led to the end long-standing ANZUS alliance. Working in the Prime Minister's office, Hensley has a great deal of knowledge to share about PM Lange and the various diplomatic missteps that led to the breakdown of the relationship between New Zealand and its post-war 'Big Brother'. Lange fans beware - Hensley doesn't have many positive things to say about his former boss, portraying him as vacillating and difficult. However, he faithfully records many of Lange's witticisms; these provide a lightness and good humour to the text that is otherwise often absent due to Hensley's conviction that leaving ANZUS was a great mistake (My favourite was Lange's description of the volume of a private conversation with Margaret Thatcher - he claimed that she addressed him 'as if he were one of the larger pre-war German rallies').The major problem with this history is that although Hensley sets out to be 'dispassionate and accurate' he cannot help but key his personal views colour his depiction of the break up of the alliance and the move towards nuclear-free New Zealand as a regrettable mistake. His partiality is most apparent in his descriptions of 'the Left' as being a monolithic and intemperate bloc of activists, and in his positive spin on Western involvement in the Vietnam War, a reading of events that is selective, at best. He is also guilty of basing most of his text on either his own views or those, like Michael Bassett, who agree with him. Overall, this is worth a read for those interested in the events and the period. Hensley is at his best when discussing the wider implications of New Zealand's actions for regional and international relations. But there is a fuller and fairer history still to be written. Good book on an important chapter in New Zealand's history. Gerald Hensley - Gerald Hensley was trained as an historian at Canterbury University, taking an MA with First Class Honours. He gave outstanding service to the country in the Foreign Ministry and in the Prime Minister's Department before retiring in 1999 as Secretary of Defence. Since retiring he has resumed historical research and writing with publications over the past years including Palm and Pine: New Zealand and Singapore, a chapter in For the Record, and another on New Zealand's decolonisation in Celebrating New Zealand's Emergence. Shortly to be published is a volume of memoirs covering some of the events of his time in government service.